Hello lovely people, thank you for stopping by to read my blog. I really do appreciate each and everyone of you. 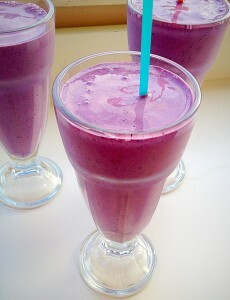 So I thought I’d share my latest Summer cool down drink with you – Blueberry Banana Superfood Smoothies. A fabulously tasty way of recharging your system. Blueberry Banana Superfood Smoothies – that gorgeous colour is enough to make you smile. Why Superfoods? Blueberries are full of antioxidants and are known to be good for your nervous system and brain. Bananas are high in Vitamin C, fibre and can help regulate blood sugar levels. They can also help with mood enhancement. These fruits have many other positive affects on the body, especially when eaten raw, which is how they are in the Blueberry Banana Superfood Smoothies. Blueberry Banana Superfood Smoothies – cool, delicious and gorgeous. 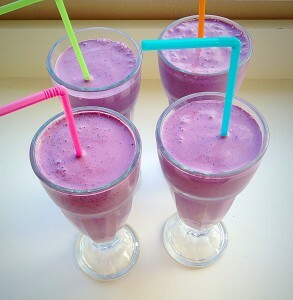 If you’re craving something sweet, as I was and don’t want to dive into a tub of chocolate ice cream, then these Blueberry Banana Superfood Smoothies will fix that craving and do your body good at the same time. Yes there is ice cream and whole milk in this recipe, you can totally switch this recipe up and use frozen low fat yoghurt and skimmed milk. 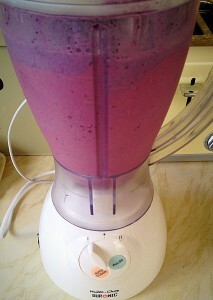 The bananas will still give the smoothie a creamy taste. So good for you – time to slurp up one of these Blueberry Banana Superfood Smoothies! I was actually really surprised that these smoothies didn’t need extra sweetening, considering the amount of blueberries added. 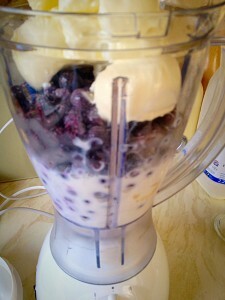 Sometimes blueberries can be a but tart, but the sweetness of the bananas offsets this, leaving the perfect balance. I’ve used frozen blueberries but fresh are fine. To keep the cold in the smoothie just break the bananas up, pop in a bag and freeze. Using bought frozen fruits keeps the cost down and gives them a longer use-by date. However, I have raspberries growing in our garden and if we have loads I would definitely put them in smoothies. Just do whatever works for you! 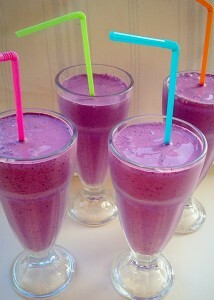 We’re pretty chilled about things like that, bit like the smoothies!!!!! 400g/14oz Frozen Blueberries – I buy mine from Waitrose most supermarkets sell frozen fruit. Peel the bananas, break into pieces and add to a liquidiser. Add the frozen blueberries, ice cream and milk. Time to whizz up the ingredients. Look at THAT colour! If the mixture is too thick add more milk. Whizz up and then pour. I really hope you try this smoothie. 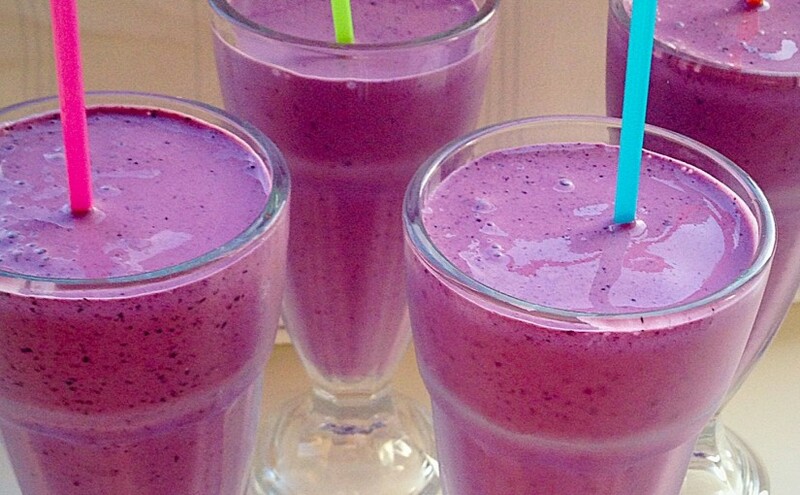 Relax, chill out and know those Blueberries and Bananas are doing you good on the inside. Let me know if you switch up the fruit combo and how it turns out. Obviously I’d like you too try this one first, but hey it’s Summer, I’m chilled with your choices.